Over 300,000 Americans have died from drug overdose in the last two decades, and that many will die from drug overdose over the next five years. Due to this dramatic increase in overdose deaths, the need for effective treatment is great. However, substance use disorders (SUDs), such as alcoholism and drug abuse, have been historically difficult to treat given their chronic cycles of treatment and relapse. As many as 75% of the individuals who complete professional treatment will relapse within one year. To improve treatment outcomes, new and supplemental approaches are needed. In our recent study, we explored if and how technology (e.g., smartphone apps) might supplement traditional treatment options and serve as an additional source of support for individuals in early recovery from SUDs. 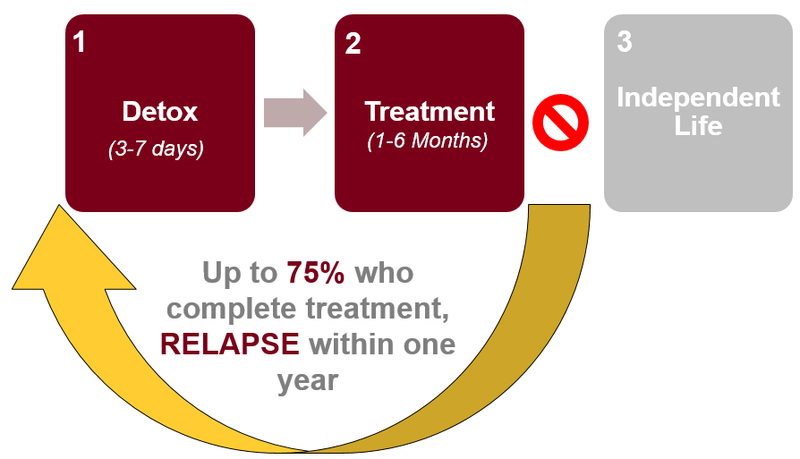 Up to 75% of people relapse within one year of treatment. Rather than confront this difficult design challenge on our own, we enlisted the help of 16 women living in a sober living home (i.e. early stages of recovery from SUDs) to act as co-designers and subject matter experts. Over the course of six design workshops, we worked in equal partnership with residents of the sober home to design supportive technology for SUD recovery. During the first workshop, the residents of the sober home talked about the technology they currently use to support their recovery and discussed how it helps them. In the second and third workshops, the residents used smartphones and tablets to explore popular apps designed to support SUD recovery and a healthy lifestyle. With regard to each app, the residents discussed what they liked and disliked. In the final three workshops, the residents discussed the biggest problems and challenges they face in their recovery, brainstormed technical solutions to these problems, and then sketched their favorite solutions. This design partnership accomplished two important goals. Primarily, it allowed us to learn from the residents’ experience in SUD recovery. But perhaps more importantly, the partnership provided the residents with control over the design of technology that will benefit them most. Research shows that women with SUDs face greater stigma compared to men with SUDs. Additionally, women have often been overlooked in traditional SUD research. Thus, we sought to provide this marginalized group a voice. We believe this design partnership provided that voice and empowered them to design personalized technology to aid their recovery. Following the six design workshops, we analyzed the residents’ discussions, problems, solutions and sketches. Through this analysis, we found five major design themes for supportive technology for SUD recovery. In one such theme, the residents made it clear that they wanted to use technology to increase their access to social support. They accomplished that goal by designing technology that leverages the social support systems available to them through their participation in 12-step groups (e.g., alcoholics anonymous). For example, the residents worked in teams to design an app that would allow them to search for and find a sponsor (i.e. a mentor in recovery) based on individual characteristics such as the sponsor’s location, gender, experience, etc. (see sketch “a” below). A sponsor acts as a trusted source of social support and is especially valuable to those new to recovery. According to residents, this app would allow individuals in recovery to find a compatible sponsor quickly and lessen the time spent without mentorship and guidance. Additionally, the residents designed app features that would allow them to communicate with their sponsor via text message (see sketch “b”) and schedule face-to-face meetings (see sketch “c”). Finally, the residents designed a functionality that would allow them to gain access to and connect with their sponsor’s social support network (see sketch “d”). This would allow individuals in recovery to extend and diversify their social support network through their sponsor’s existing contacts. To learn more about our research and findings, check out our paper or come see my presentation at CSCW 2018.